Does the thought of Christmas shopping with crowded car parks, thousands of people and flashing red SALE signs everywhere fill you with panic? Never fear, I have put together a quick gift guide filled with wonderful things you can buy online! Hurrah! And as keen as I was to just make this a gift guide of things I’d like for Christmas, I decided to be selfless and throw in some things for the boys too. 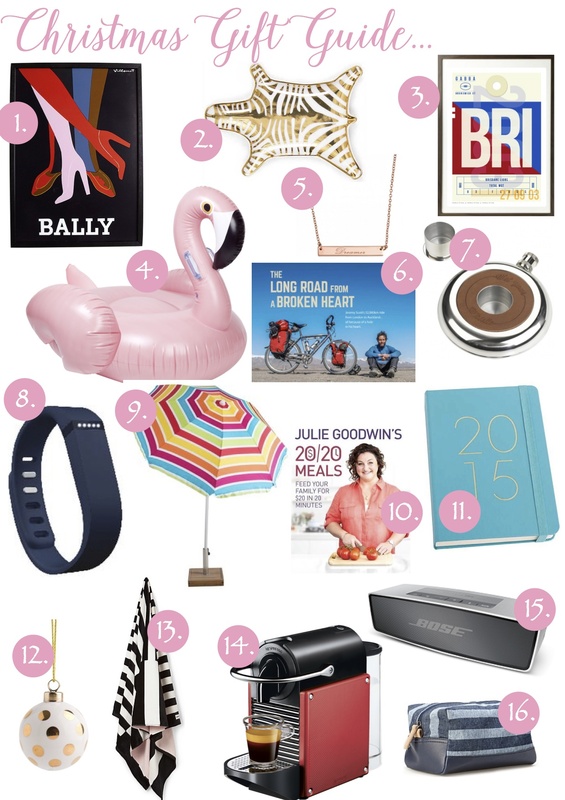 Bally Framed Print, $59 | Zebra stacking dish, $50 | Brisbane Lions Luggage Tag Wall Art, $55 Hardtofind |Giant inflatable flamingo, $90 | Samantha Wills Dreamer Necklace, $120 | A Long Road From A Broken Heart by Jeremy Scott, $75 | Gent’s Hardware Hip Flask, $59.95 | Fitbit Flex Wireless Activity and Sleep Wristband, $118 | Torquay Beach Umbrella, $41 | Julie Goodwin’s 20/20 Meals Recipe Book, $35, | Kikki K 2015 A5 Daily Leather Diary, $44.95 | Kikki K Ceramic Bauble Dots, $9.95 | Country Road Mulholland Beach Towel, $59.95 | Nespresso DeLonghi Pixie & Aeroccino3 Carmine, $394 | Bose SoundLink® Mini Bluetooth® speaker, $249 | Country Road Stripe Wetpack, $49.95.